Alicia Keys (born January 25, 1981) is an American singer-songwriter and actress. Throughout her career, Keys has won numerous awards and has sold over 35 million albums and 30 million singles worldwide. Billboard magazine named her the top R&B songs artist of the 2000s decade. In 2010, VH1 included Keys on its list of the 100 Greatest Artists of All Time. Billboard magazine placed her number ten on their list of Top 50 R&B/Hip-Hop Artists of the Past 25 Years. 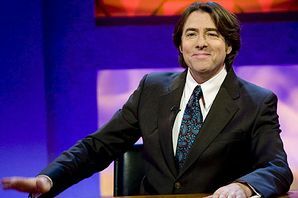 Jonathan Ross (born 17 November 1960) is an English television and radio presenter. Ross is known for his distinctive voice, flamboyant style of dress and light-hearted banter. In 2012, he won a Special Recognition award at the British National Television Awards. Before watching the video clip, go through the following notes on vocabulary found in the interview and familiarize yourself with their meaning. Three (or third) time’s the charm – a common saying. In some western traditions, it is believed that the 3rd time something is attempted, it is more likely to succeed. “Woot” – an expression of excitement and celebration. “Booyah” – also a shout/expression of excitement and celebration. In the interview, Alicia Keys is probably pretending to be ignorant, as the word is quite widely known and used by Americans. Watch clip 1 and answer the following questions. Refer to the context of the clip and match the words in bold with their definitions. Familiarize yourself with the meaning of the following entries. “Look at that” – isn’t really asking someone to look at something, but is rather an exclamation of disbelief or surprise. Watch clip 2 and answer the following questions. Wee – to urinate (British English). In the interview, Alicia Keys mistook the phrase for the Nintendo “Wii,” a video game system. Tinkle – the sound that represents urination in many English speaking countries. Porta-Potty – Portable toilets. “Porta” is short for “Portable” and “Potty” is what children say when they need to go use the toilet. “Tie and tails” kind of affair – “Tie” here means the bow tie or neck tie, and “tails” means coat tails, usually of a tuxedo. Which means the event is formal. "Empire State of Mind" – a song by American rapper and hip hop artist Jay-Z, featuring vocals and a chorus from Alicia Keys. Watch clip 3 and put a check the topic that was in fact discussed. Leave the box blank if the matter was not mentioned at all. The Cello - a bowed string instrument. It is a member of the violin family of musical instruments, which also includes the violin and viola. The Otamatone - a Japanese musical instrument. It is a musical-note shaped singing toy which requires two hands to be played. Watch clip 4 and check the topic that was in fact discussed. Leave the box blank if the matter was not mentioned at all. Most words tend to have more than one definition, it is therefore very important to have the ability to identify word meaning from the context. The following exercise is designed to help you practice context clue skills. Consult a dictionary whenever necessary.